Late last month, astronomers announced the discovery of the most distant known quasar, designated ULAS J1120+0641. About 28.85 billion light years away, this quasar challenges many of our ideas about the early universe. A quasar (or quasi-stellar object) is the central region of a massive galaxy, from 10 to 10,000 times as big across as that galaxy’s central black hole. Material forming an accretion disk around these supermassive black holes emits the radiation we see as the quasar. A quasar is generally so luminous as to make the rest of its galaxy invisible by comparison. For example, this particular quasar emits over six trillion times as much light as our sun. Daniel Mortlock of the Imperial College London and his colleagues used the United Kingdom Infrared Telescope on Mauna Kea, Hawaii, to search for objects that did not show up in visual light surveys of the same area of the sky. This allowed them to isolate objects of very high redshift. In time their search revealed the quasar ULAS J1120+0641. The numbers in the quasar’s designation are its celestial coordinates: right ascension 11 hours 20 minutes and declination +6 degrees and 41 minutes. This position is in the constellation Leo, the Lion. 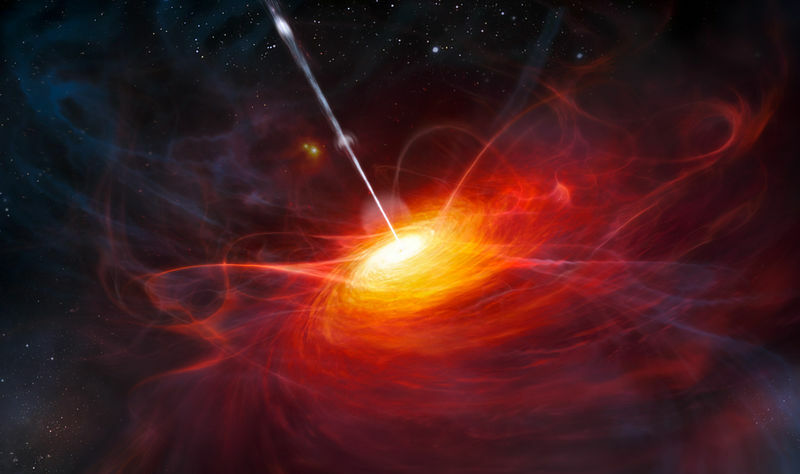 Before publishing their results, the astronomers used spectra taken at the Gemini North Telescope (in Hawaii) and the Very Large Telescope (in Chile) to establish a specific redshift of 7.085, the highest redshift known for a quasar as of June 2011. Redshift occurs because when an object is receding from us, we see the light it emits at a longer wavelength than it would otherwise have. 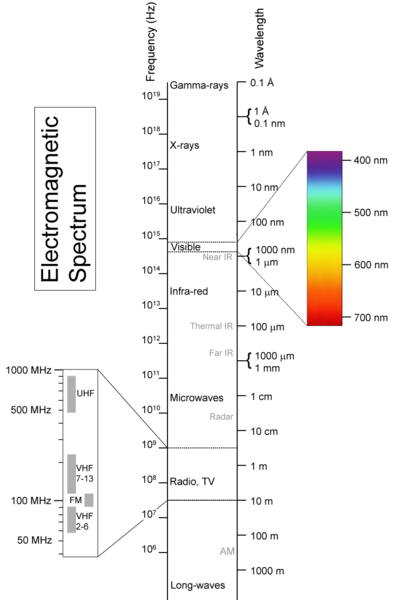 In the visible spectrum, red and orange light has the longest wavelengths and blue and violet light the shortest. Thus the lengthening of wavelength in light from an object moving away from us is a redshift. The expansion of the universe that began with the Big Bang involves the creation of new space in between distant galaxies rather than their motion through space. As a result, more distant galaxies recede from us faster than those nearby. Larger redshifts, then, indicate greater distances. For example, most of the light this quasar emitted was actually ultraviolet light, with a shorter wavelength than we can see. However, we see its light redshifted into the infrared, at wavelengths longer than we can see. where λe is the wavelength normally observed by a particular gas, and λo is the wavelength of the observed absorption line. A negative z indicates a blueshift, in which an object is approaching the observer. A redshift of 7.085 corresponds to a distance of 28.85 billion light years. (Such distances are indeed possible, even though the universe is 13.7 billion years old, if we consider that the universe has greatly expanded in those 13.7 billion years). It also means that when we look at this quasar, we are looking about 13 billion years in the past, to a time about 770 million years after the Big Bang. Interestingly, this is so early in the history of the universe that it may precede the era of reionization. About 380,000 years after the Big Bang, the universe had cooled enough to allow neutral hydrogen atoms to form. At a later time, less than one billion years after the big bang, newly formed galaxies began to emit radiation energetic enough to reionize hydrogen atoms (i.e. liberate the electron from the proton). Monckton concluded that the spectra of ULAS J1120+0641 indicate up to 10-50% neutral hydrogen, while spectra of most quasars indicate less than one percent. This is our first direct glimpse of a period so early in the history of the galaxy. A surprising result is that the central black hole of the galaxy containing ULAS J1120+0641 has a mass about 2 billion times our sun’s mass. Current models do not predict that a black hole that massive could form so soon after the Big Bang. Once again, the universe proves more wondrous than we can imagine. Next Post Dr. Bob Bakker - Special Appearance!